The neighbor across the street has a plastic Santa with a light bulb inside it. I always know the holidays are here when it suddenly appears by her garage. I've never actually seen her put it out—I've come to believe that the incandescent Santa arrives on its own. It's a fickle Santa. One year it decided not to show up at all and the neighborhood was much the poorer for it. So far, this year, I am still waiting. As I write this I look out the window and into the hazy day. The neighbor's garage is sans Santa. Missing the jolly fellow, my mind wanders to Italy. The Italians have these big, plastic Santas that promote 32 flavors of hot chocolate. Alas, they have no light bulbs and therefore are not lit from within. But, they do come with Heineken umbrellas and a huge cup of frothing hot chocolate and that is worth something. 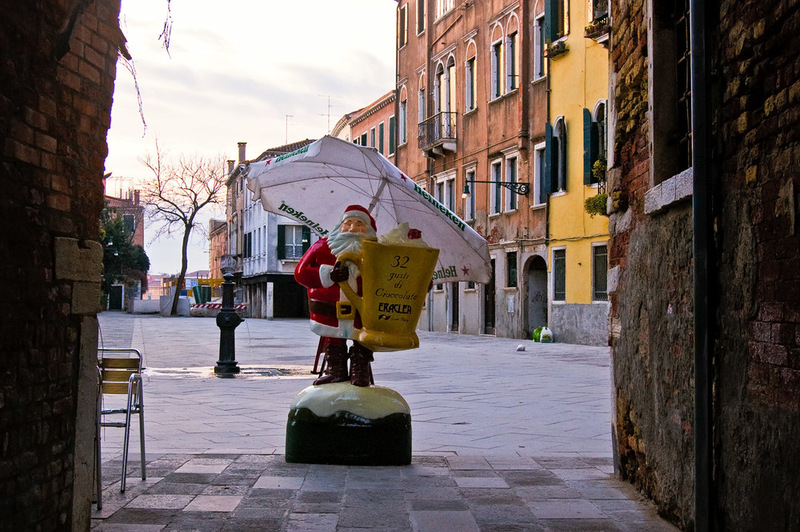 Several years ago we spent the holidays in Venice and I would pass the chocolate Santa numerous times a day. I recognized him at first pass because he has a cousin Santa in Parma that I'd seen earlier in the trip. The Parma chocolate Santa was without umbrella but I wasn't thrown by this variation. Once you meet a Italian chocolate Santa you remember him. 32 gusti di Cioccolata. 32 flavors of chocolate! We live in a world of miracles and blessings. The chocolate santa reminded me of that every time I saw him. He was the very symbol of abundance and good flavor. Furthermore, he made me smile—as does the santa across the street who has not yet arrived this year. I look out my window once more. He's still not here. What is taking so long?